Artfully combining comfort and style, this handsome collection is sure to impress and its available at RC Willey. It's eye-catching button-tufted back, generous dimensions and modern appeal are sure update the look and feel of your living spaces. Includes left-arm facing chaise, three armless chairs, and two corner units. Ottoman Sold Separately. Classic Modern Granite Gray 6 Piece Sectional Sofa - Blaire is rated 4.8 out of 5 by 13. Rated 5 out of 5 by skym Beautiful sectional! Great piece to add to our new house. It's great looking and comfortable. Looking forward to enjoying it for many years to come. Rated 5 out of 5 by 350z Lovely accent piece Looks great and compliments my living room. Definitely serves the intended purpose. Rated 5 out of 5 by KtfromID Love my couch!! This couch is Great! I love how firm it is and the fabric feels great. I am very happy with my purchase. Rated 5 out of 5 by Toadstool In Love This sectional is amazing! So comfortable, very modern looking. Room for lots and lots of people. 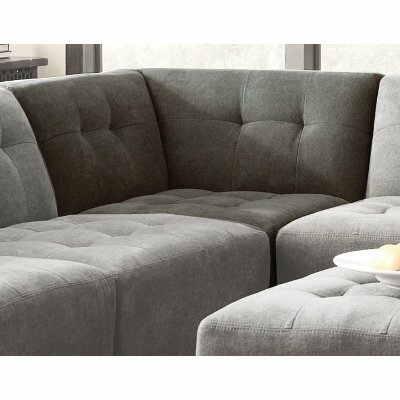 Rated 5 out of 5 by KingJames Granite sectional review This couch is awesome, throw on some accent pillows to lay against and it becomes even more comfortable. The pieces all match so moving and arranging the couch is a breeze. This sofa could be broken down into smaller sections for smaller rooms or added to for larger rooms. I would highly recommend. Construction is excellent with 2 kids jumping all over this couch. 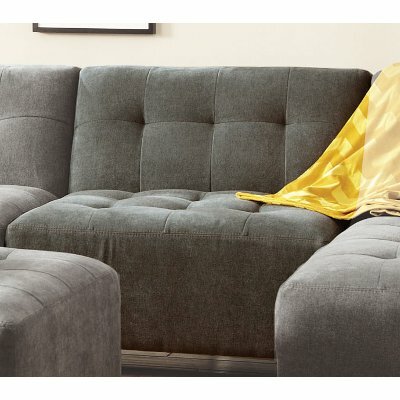 Rated 5 out of 5 by LoveLodi Love this sectional I’ve had this for about a year and I love it. It’s very modern and minimal, but surprisingly comfortable too. Rated 4 out of 5 by MrsSheehan 2.5 years and still going strong The chaise lounge has a bit of sagging now but overall it has been a great couch. Some of the seems have frayed due to normal wear from having two toddlers, two dogs and a cat. All guests love that we can put the pieces together to make a very comfortable bed. I don't think we will ever get rid of the couch, it'll just be demoted to the bonus room lounger. Rated 5 out of 5 by MsLasVegas Love my couch This couch is great. I was really not wanting a sectional that came in pieces but ultimately I went with it cause it had all the seating I needed. This couch is BIG! I can fit a ton of people on it. Great for a bigger family. The pieces really don't moves or slide once you place them where you want (I have hardwood). The color really is great. and the couch is comfy. It's not overstuffed but it I also don't have big pillows that move and shift. It doesn't come with throw pillows so you choose any color you want to go with it. I'm so glad I chose this one. I bought 3 corner pieces and 3 middle sections with the ottoman and I can arrange it in any way I want and it will work in any room I ever decide to put it in. Also very easy to clean and doesn't leave water marks. Rated 5 out of 5 by hoodouken So far so great We've had this couch for about 6 weeks and we love it. What I like the most is the firmness of the couch. My worry was it would sag over time. I don't believe that will be the case with this guy. It's not so firm that it's uncomfortable, it's really that just right feel and fits perfectly in our living room. 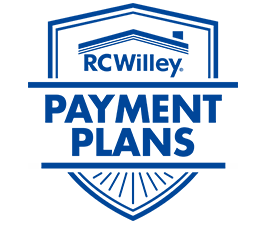 Rated 5 out of 5 by NewToUT Wonderful product from a great retailer Great sturdy product. Product is quite heavy so no need to worry about pieces moving. Delivery was perfect from RC Willey as well! Rated 4 out of 5 by Satisfaction4us Firm comfort, versatile and looks ! We have had sectionals in the past and this set is better for us because we like the firm feel of the backs and seats rather than the pillow soft feel. The backs of the sofa are lower so it makes it easier to see the TV from the kitchen table while we are eating dinner. Some folks may like a taller back on their sofa, so this may be for them. The sections are sturdy but light weight so moving them around for cleaning is not a problem. The color blends in with our decor and the stitching adds just the right amount of accent. Rated 4 out of 5 by TypicalDad So far so good Thus far the sectional is very comfortable and the fabric has been durable and easy to clean. Perfect piece for hard-to-navigate corners or narrow staircases.